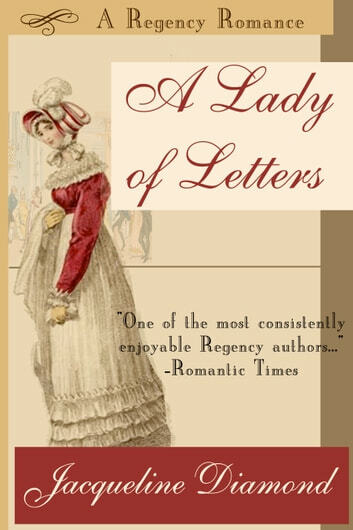 This Regency lady has a dangerous secret! It isn’t Marianne Arnet’s fault that her parents are reputed to be spies for Napoleon and have fled England. Now the handsome and powerful Lord Whitestone is threatening to bar her from the upcoming London Season and deny her a longed-for chance to mingle in the literary world. Lord Whitestone doesn’t realise that Marianne is his secret correspondent, and that he’s already half in love with her. Now she’s determined to come to London, even if that requires employing a disguise. A love for the books of Jane Austen drew Jacqueline Diamond to the world of the Regency romance, and her half-dozen novels in the genre have delighted readers for more than thirty years. Jackie has gone on to sell more than a hundred novels from mysteries to medical romances and romantic comedies. A former Associated Press reporter in Los Angeles, Jackie has received a career achievement award from Romantic Times magazine and two finalist placements for the RITA Award. Diamond is the author of A Lady’s Point of View, Lady in Disguise, Song for a Lady, The Day-Dreaming Lady, and The Forgetful Lady. Excuse Me? Whose Baby? & Follow that Baby!